A man who was barred from a town centre pub for having an epileptic fit said he is ‘disgusted’ with the way he has been treated. 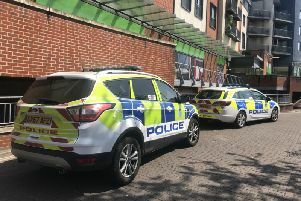 Alan Edmends, 45, from Selden Road, said he was meeting a lady outside The Three Fishes pub in Chapel Road, Worthing, last week when the fit happened. When he returned on November 9, Mr Edmends claimed he was asked to apologise for ‘causing a disturbance’ and was barred after he refused, despite explaining he had epilepsy. Eddie Gershon, JD Wetherspoon spokesman, said the manager barred Mr Edmends because he pushed a staff member and would not apologise. But the father-of-five said he could not remember what happened during his fit and would not say sorry because of the circumstances. He said the first thing he remembered afterwards was being inside the pub with police officers and a staff member who lent him her jumper to keep him warm. The police took him home. Mr Edmends criticised the pub for calling the police rather than an ambulance. The day he was barred, he filed a formal complaint but the customer services team replied saying they would not be overturning the decision. Mr Edmunds, who has been diagnosed with epilepsy for 20 years, said he was ‘disgusted’ by his treatment, which he described as ‘discrimination’: “If people have disabilities, don’t judge them. There is more to it than meets the eye. Mr Gershon said: “The manager was unaware of his medical condition.